South Georgia Mini Sessions!! Still A Few Spots Available! Go on over to our Facebook page and give us a like. That's where you'll find a coupon code to save 30%! THIRTY PERCENT. That's 1/3 off the price of an already ridiculously low Mini-Session price! And yes, even the discounted sessions still receive $50 print credit. So in the end, the session only costs you $50! Now THAT's a bargain, folks! Once you get the coupon code, come back here and click here to book your session. Make sure you hurry as there are only a few spots left. I won't be back in South Georgia until late November. A couple of reasons that I love mini-sessions because they provide the perfect way for new clients to "try out" my services at a discount and it gives me the chance to meet and shoot new people. Autumn is the perfect time to schedule a mini-session. Think about it, nature is really putting on a show right now. The trees have all changed into their bright and gaudy winter coats - red, orange, yellow, deep purple - the colors are endless! Did you know that there are a whopping 338 parks in Atlanta?! If you're in Atlanta, you are literally a stones throw away from a great, colorful outdoor space. You couldn't ask for a better backdrop for holiday portraits! I had the opportunity to meet Crosby and her sweet family this past weekend at Dellwood Park. Dellwood is a lovely slender slip of a park. Four lanes of Ponce De Leon traffic flank the front side of the park but it's amazing how tranquil it feels when you're standing in the perfect balance of open space and mature deciduous trees. A paved path dotted with wrought iron benches every few yards, runs along the back of the park. 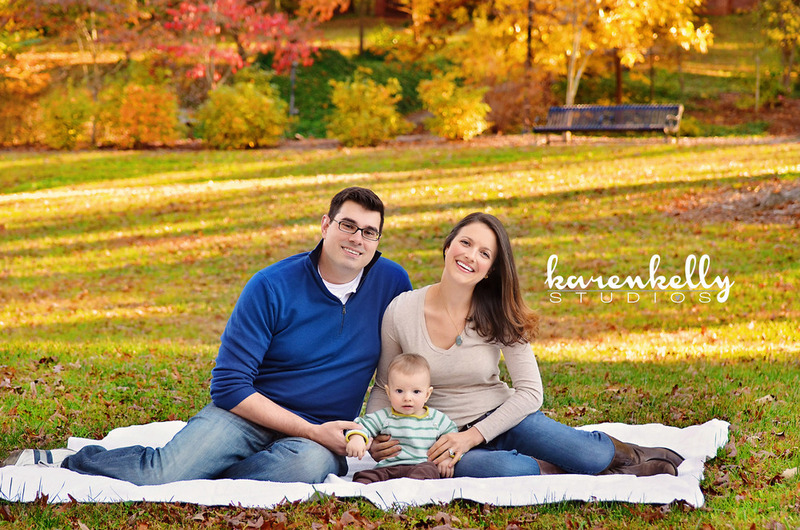 Dellwood Park provided the perfect backdrop for this sweet family mini-session. I really loved how the mostly neutral color palette of their outfits contrasts with the vibrant fall foliage! If you haven't scheduled your holiday portraits, call or email me today to try a mini-session! Through the month of November, you get a 30 minute session and 8 retouched high-resolution digital images - just in time to order those fabulous holiday cards!